What little girl or boy doesn’t love to play dress up? Well, Kidorable not only gives kids the chance to dress up as a ballerina, mermaid, dinosaur or even a frog to name a few! Not only does your child get to have fun dressing up but Kidorable products will keep them protected from the rain and cold or even get dry after a bath with their full line of rain gear, outerwear, towels, and even backpacks. We had to have the Ladybug Rain Coat it was her birthday theme and now I’ve made Ladybugs her thing! I couldn’t wait for it to arrive and try it on her. She got all excited when it came and I showed it to her and happily let me put it on her. I ordered it a bit bigger so next Spring when we get all the rain it will still fit her. I am really happy with the quality and love the little details Kidorable has put into it, the pockets are in the shape of ladybugs and even have little antenna made from ties. The buttons are nice and kid friendly because they are easy to fasten and made with plastic. Kidorable rain coats also come with a matching Ladybug collection umbrella and it is just too darned cute. It even has little ladybug eyes on the top that pop up and has kid-safe ends that are rounded so they don’t poke themselves with it. The button to open the umbrella is also a nice plastic and rounded so it’s gentle on kid fingers and easy for them to open and close it. Baby Digger won’t hold onto it yet but she loves to look at it and play with it. I love that it has a nicely fitting hood because Baby Digger won’t hold an umbrella yet and the hood keeps her head nice and dry. Kidorable also gives you a matching hanger when you purchase a raincoat, I love it and wish my daughter’s entire closet had hangers as nice. 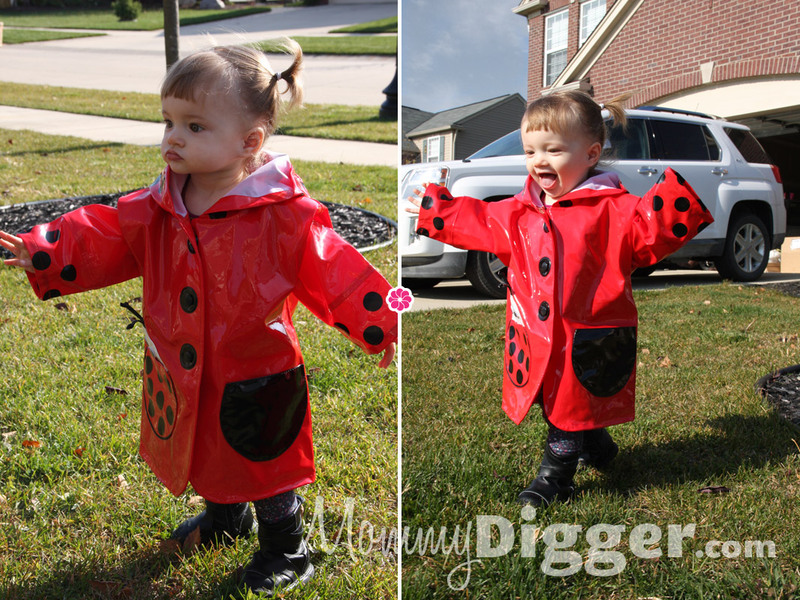 I just love her Kidorable Ladybug raincoat and it is by far the cutest I’ve seen, are great quality and can bring fun to a rainy day! Once next spring comes around I’m going to have to get her the matching boots 🙂 Kidorable offers their adorable rain coats in a full range of sizes from 1T up to 6x. Kidorable rain coats are available at www.kidorable.com for $36. They also have a full line of kids outerwear, umbrellas, backpacks and more. I received a Kidorable Ladybug rain coat for the purpose of this honest review. All thoughts and opinions are my own. This post was written by me and not edited by anyone.